Nuclear incidents generally refer to events involving the release of significant levels of radioactivity or exposure of workers or the public to radiation (FEMA, 1997). Nuclear accidents/incidents can be placed into three categories: 1) Criticality accidents which involve loss of control of nuclear assemblies or power reactors, 2) Loss-of-coolant accidents which result whenever a reactor coolant system experiences a break or opening large enough so that the coolant inventory in the system cannot be maintained by the normally operating make-up system, and 3) Loss-of-containment accidents which involve the release of radioactivity. The primary concern following such an incident or accident is the extent of radiation, inhalation, and ingestion of radioactive isotopes which can cause acute health effects (e.g. death, burns, severe impairment), chronic health effects (e.g. cancer), and psychological effects. (FEMA, 1997). Three Mile Island Nuclear Generating Station, Londonderry Township, Dauphin County. Most of these generating stations are concentrated in the eastern portion of the state. Nuclear incidents rarely occur, but the incident at Three Mile Island is the worst fixed-nuclear facility accident in U.S. history. The resulting contamination and state of the reactor core led to the development of a fourteen-year cleanup and scientific effort with a minimum cost estimate of nearly $1 billion. Despite the severity of the damage, no injuries due to radiation exposure occurred. 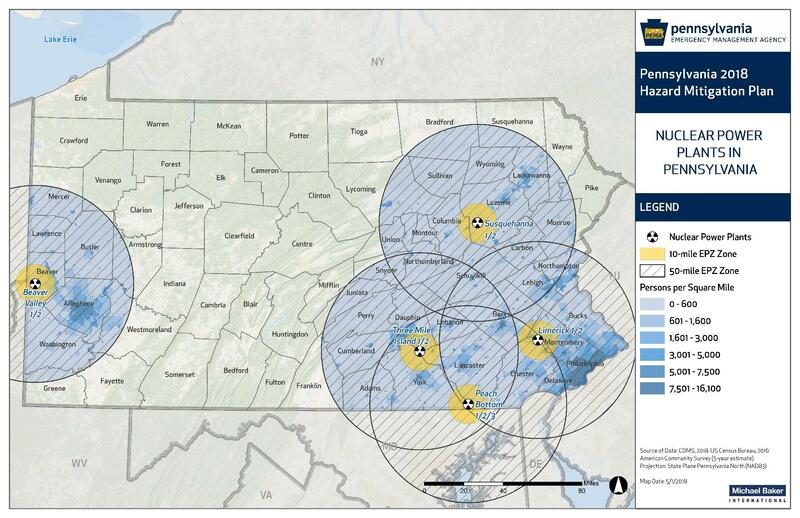 Pennsylvania is home to the only nuclear power plant General Emergency in the nation. Since the Three Mile Island incident, nuclear power has become significantly safer and is one of the most heavily regulated industries in the nation. Despite the knowledge gained since then, there is still the potential for a similar accident to occur again at one of the five nuclear generating facilities in the Commonwealth. The Nuclear Energy Agency of the Organization for Economic Co-Operation and Development notes that studies estimate the chance of protective barriers in a modern nuclear facility at less than one in 100,000 per year (Nuclear Energy Agency 2005).